Last month I was nominated for the Liebster Award by Englepip. Her blog combines photography and writing, and she just released a great post about storm troopers. Be sure to check it out! My first nomination for the Liebster Award was back in December of 2015 – over two years ago. I’m therefore grateful to Englepip for giving me this chance to revisit it. I started my blog in July of 2015. I wanted to contribute to jaguar conservation in some way, but lacked money and specialized training. But I knew that I was at least a B-grade writer, so I started a blog. Who has most influenced your life choices? My father. He made sure to take me to parks when I was little, helping to instill my love of nature. 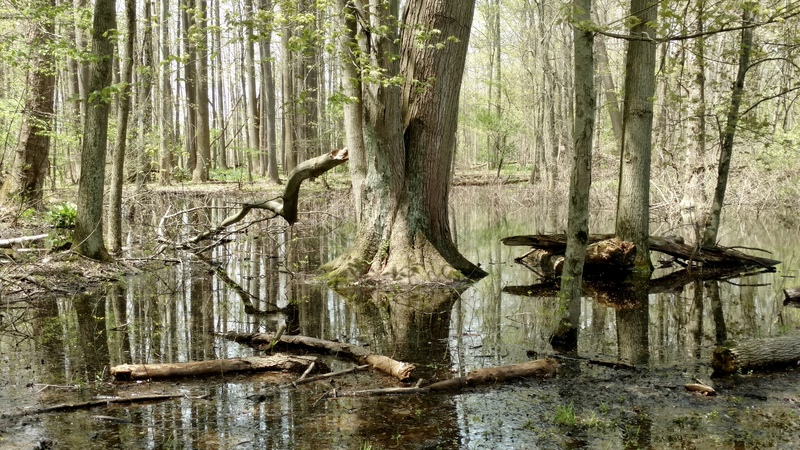 A vernal (springtime) pool at Carlisle Reservation; one of the parks I used to visit when I was younger. Where have you spent most of your life and what is good/bad about living there? I’ve spent most of my life near Cleveland, Ohio, which I will always consider home. I like the people there, the art museum, Lake Erie, and the snowy winters. Cleveland has its downsides though; most notably the poor economy and social inequality. Wherever the two meet, crime follows. 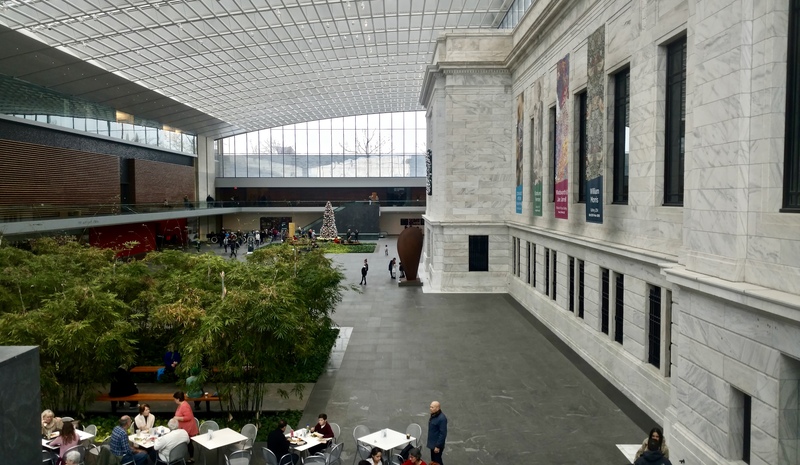 Looking out over the atrium at the Cleveland Museum of Art. What is your favorite food and what makes it so special for you? Zuppa Toscana, a soup that started as an Olive Garden recipe. It’s just good. If you could do something for the world, what would it be? Given my interests, I’m inclined to emphasize the conservation of wildlife. However, our current environmental woes are symptoms of a much larger problem: the plunder and subjugation of the many for the greed and pleasure of the few. So if I could do anything for the world, it would be to help motivate a revamping of our dominant value and social systems. We need to prioritize cooperation and mutual concern above hedonism and greed. What is your favorite film and who did you see it with? The Return of the King, which I initially saw with my family. What would be your favorite holiday? Christmas. It reminds me of happiness and snow. 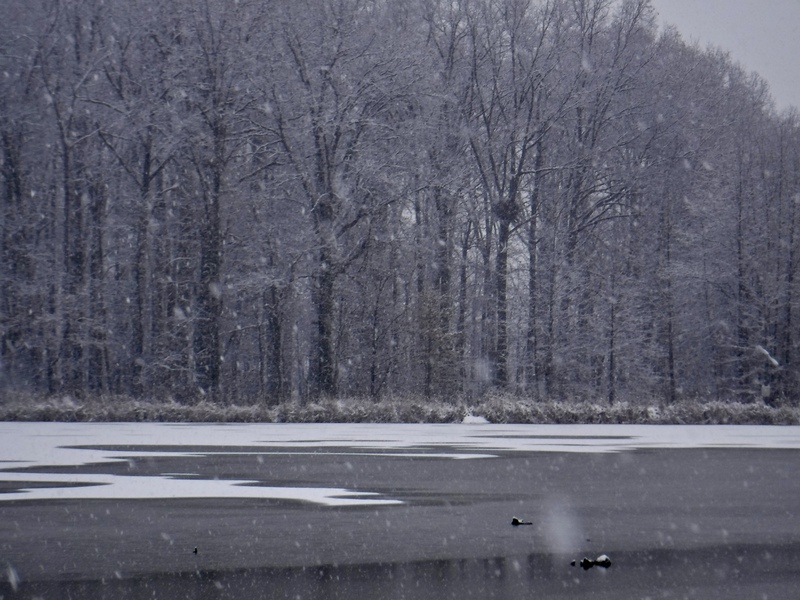 A snowy landscape at Sandy Ridge Reservation from this past Christmas. That’s a bald eagle nest in the background. If you could have your life again what is one thing you might do differently? I would try harder in elementary and high school math. If you could meet anyone from the present or history, who would it be and why? Eminem. He seems like someone who’s “seen it all,” and consequently might understand the world better than most. How much time a week do you reckon you spend using the internet? If you had three things to do or achieve, what would they be and why? Return to Belize to visit my friends; spend at least one year in Antarctica, possibly helping to document some of the work being done there; and write a book. A good book. As always, nominations are tokens of my appreciation. Nominees are not obliged to accept them; nor is the following list arranged in any particular order. 1. What are your favorite types of posts to create, and why? 2. Where do you do your best writing? 3. What is your typical process for creating blog posts? For example, do you write several drafts before publishing a post? Or do you hammer it out in one go? 4. Do you engage in other forms of art, besides writing? If so, which ones? 5. What is your favorite book or book series, and why? 8. If you could travel anywhere, all expenses paid, where would it be? 9. What was your favorite subject in school, and why? 10. Have you spent time outside today? 11. If your answer to the previous question was, “Yes,” then what did you do? If it was, “No,” then why not? Oh snap, sorry about the gender confusion! I’ll make the proper edits. No problem, for some reason I thought that you weren’t into blog awards. But I couldn’t remember for sure. Congrats on the award and thank you so much for the nomination!! Haha, there are many warmer places I’d like to visit than Antarctica. But Antarctica is one of the places I’d like to visit the most. It’s definitely a one-of-a-kind destination. Congratulations on the nomination! :) And quite enjoyed reading your answers — always nice getting further insight into interesting people, and good writers (special bonus when that person is both of those things). Cheers, and good luck with the award! Reward posts are fun to read, because they’re great opportunities to get to know people we only catch glimpses of through the blogosphere. Also, do you still have a blog? I keep getting a “nothing found” message when I click on the link to your page. They sure are — they remind me too to read as much as I write, so I don’t miss too much of all the great content that’s out there these days! Oh wow, I did not realize it was still doing that! Yes, I do still have a blog, but my settings went a bit schizophrenic there — should be good now, thanks so much for bringing that to my attention! ooh, I can’t believe I didn’t see this post! I loved to read your answers on all the different questions, and was really surprised to see Eminem pop up there! Do you listen to his music, too, or are you just interested in the person? Hi Monika! Haha, there are many facets of myself that I haven’t shown on here. I didn’t listen to Eminem’s music until a few weeks ago, and now I can’t get enough of it. I especially like his more recent work. well, I’m looking forward to seeing more facets of you! Two years and you’re still such a mystery :P haha you and Eminem don’t really go together in my mind but then I used to listen to him, too, so I shouldn’t be so surprised :D funny that you “found” him so late! This might be an illusion, but it seems that we “find” things like artists when we’re meant to. It is funny that I’m getting into Eminem’s music so late, but also strangely appropriate.